Inside the tasting area at Joseph Phelps Winery. You can save lots of money by trudging out to the local Target on Black Friday to line up in the cold predawn hours. That’s just not me. I love a deal, but not at the expense of my post-holiday sleep and dignity. Instead, Christine and I got up early the day after Thanksgiving to ensure we had plenty of time to make our 11 a.m. tasting appointment at Joseph Phelps Winery. Located off Taplin Road, up valley near St. Helena, Joseph Phelps is one of the great names of Napa Valley and Christine and I are trying to polish off our Napa palates by visiting as many of these old mainstays as we can. It’s just the way it is when you grow up in area that you don’t appreciate the local highlights as well as the tourists. Today, Phelps is big time and the tasting area is located in an impressive room housing several large, but unused, wooden fermentation tanks. The tastings proceed at your leisure and Christine and I took a few breaks to wander around the grounds to enjoy the scenery and the pleasent vibe. We started our tasting with Phelps’ Freestone line. This winery is located on the Sonoma Coast and produces cooler climate varietals like Pinot Noir and a restrained Chardonnay. Christine and I disagreed on Freestone. She loved all of their stuff, especially the Pinot, but I found them to be a bit too acidic, a little thin and lacking in the finish. It’s a definite style, I’m just not sure if I enjoy that style. When we started moving into the Phelps’ labeled wines, I thought to myself that these were more my speed. The Phelps Napa cab had plenty of ripe, dark fruit flavors as well as some green undertones and cedar. But the best, bar far, was the winery’s Insignia label. This wine is made from the chosen lots of the winery’s estate vineyards, and Christine and I were both floored by the quality. The ’06 Insignia had such a redolent and enticing aroma that I almost felt I didn’t need to even taste it, I knew it would be good. And it was.This is the winery’s flagship wine, which receives all the praise and adulation and you can see why. Oh, but at $220 a bottle taking one home for our modest cellar was not just going to happen. It would be nice to to just say, “Oh sure, let’s get a case for the celler and one to enjoy now,” but we’re not there yet, but thanks to the high rollers who keep our industry rolling. Christine and I were both pretty interested in the wine and as two industry folks we soon started peppering the tasting associate with just a few too many questions. “How much per unit do your bottles cost?,” asked Christine impressed by the custom French glass. 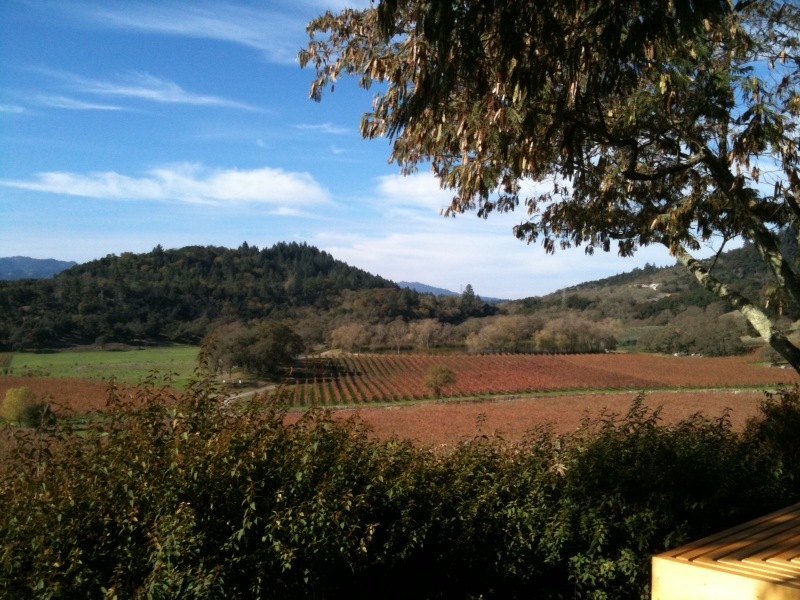 The view from the terrace, during our "Terrace Tasting" at Joseph Phelps Winery. 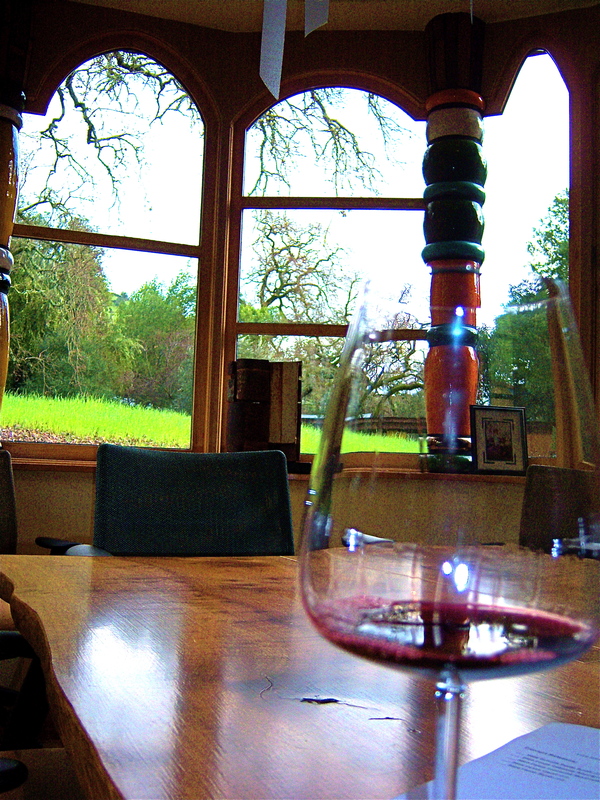 Late fall is a great time to go wine tasting. Not wanting to embarrass anyone, we backed off and just went back to praising the Insignia. 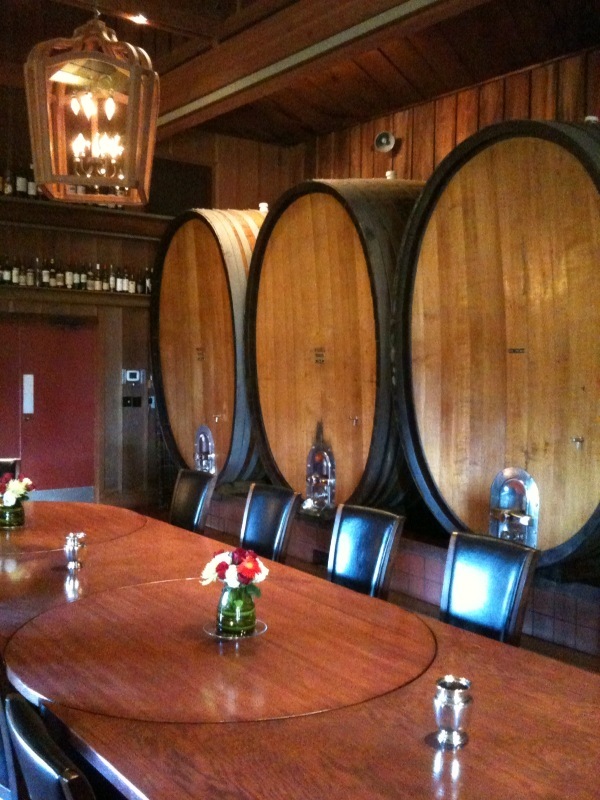 A basic tasting costs $25 and can be arranged by calling (707) 967-3720. The relexed pace and beautiful grounds make it well worth a visit. And I think Christine and I have a new tradition: Black Friday Tastings. While I don’t think places like Phelps will have much in the way of “doorbusters,” it sure is a hell of a lot more relaxing that wrestling with an obese woman over a Blu-Ray player in a aisle at Target. 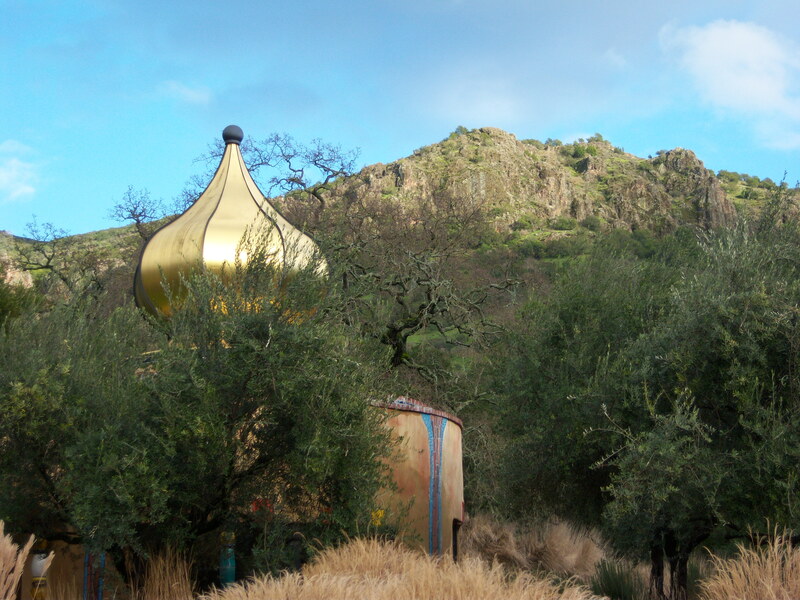 The distinctive cupola of Quixote Winery peeks out from trees in front of the cliffs of the Stags Leap district in Napa Valley. A buddy and me were just driving along Silverado Trail in Napa recently without any plans and time to kill when he suggested we check out Quixote Winery. A few years ago, my friend John had installed wireless internet at the winery and he remembered the winery’s wild architecture. As luck would have it the winery, which is usually only open for tastings by reservation, had opened its doors to the public for tastings that afternoon. Quixote Winery is worth a visit just to look at the grounds and the winery, but the wines turned out to be quite good too. Tasting at Quixote feels like being inside a work of art and it actually quite literally is. René explained to us in detail how the building was designed by Austrian artist Hundertwasser. I’m no art student and my art appreciation is pretty poor, but René had a book of Hundertwasser’s art for us to enjoy and we received a quick tutorial on the Austrian’s bold works of contemporary art. 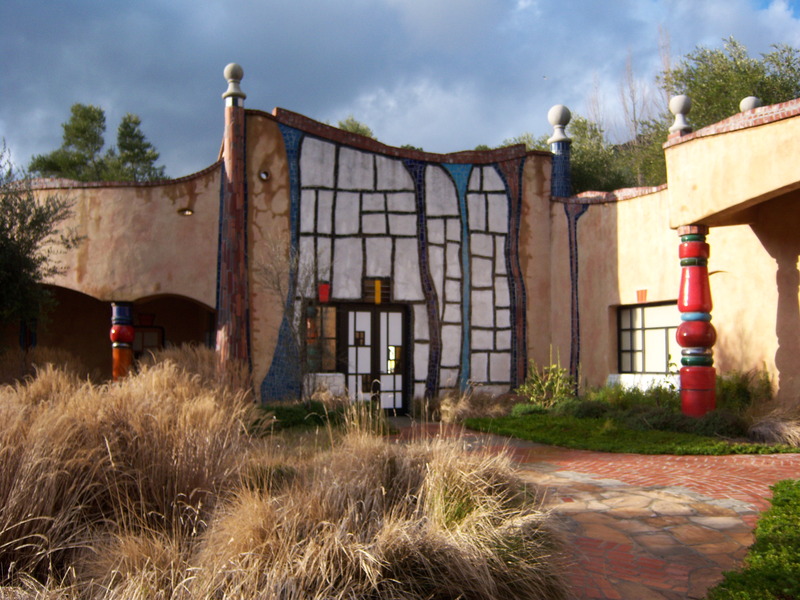 The artist created several building projects in Europe but Quixote Winery is his only American piece and after finishing the winery Hundertwasser passed away. The building reflects his style of no straight lines, a “living roof” planted with trees and grass, and cupolas and towers dotting the structure. I had thought I would find it uncomfortable and intimidating to taste in such an artistic building but instead found it to be a warm and inviting atmosphere for a tasting. It's a cool scene at Quixote Winery. I didn't see any windmills though. And the wine was great. Our tasting cost $20 each (the tasting fee was waived with a purchase) and included four vintages. We started with a Cab that was quite typical of the Stags Leap area of the Napa Valley. Quixote prides itself on its estate Petit Sirah. We tasted two, an ’05 and an ’02. The ’05 was quite nice with strong flavors and a bone dry finish but the ’02 was really good although at $70 a bottle it was too steep for my modest means. I did buy a bottle of the winery’s ’05 Grenache-Mourvedre blend ($40 a bottle), which René said is quite a rare blend. This wine had just a great balance of fruit and acidity and it was really approachable. John, who enjoys wine, but readily admits to being a novice said he could just drink it all day. On the palate the wine had red fruit flavors like a little bit of strawberry and a nice clean, finish. A visit to Quixote Winery brings you to an intriguing intersection of art and wine. Such a combination can be found at other wineries, but exploring the relationship and similarities of fine wine and fine art is too complex for my simple musings. Instead, I’ll just say that the art inherent to the building broadened your understanding of what a space can be and prepared your palate for the artistry of winemaking. The Art of Hundertwasser can be found in every corner of the winery. Even the bathroom was pretty wild.